Reading through the CV’s of Mojo Mambo’s members will reveal frequent commonalities as many of them have worked together over the years in various projects and myriad musical styles. The chemistry of players who have collaborated together in many different projects over a long period of time cannot be denied. 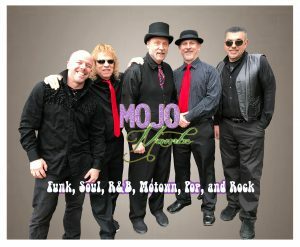 But more so within this band, it is the mutual respect, professionalism, camaraderie and sense of fun that binds the performers together and it certainly shows on stage with the tightly knit group that is Mojo Mambo. A versatile and dynamic front man, Johnny B’s passion for music is surpassed only by his love for the audience. He has performed lead and backup vocals, as well as, played drums, percussion and guitar for such local groups as Stony Lane, Masquerade Jones, The Dred Sox, Mid Life Crisis, Ezra, Mixology, Electric Soul and Beyond Reazon. Johnny B knows how to give the crowd what they want, whether it’s music to dine by or a reason to dance. 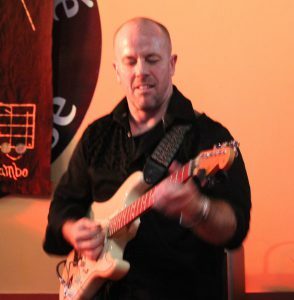 Mark is a multidimensional musician moving easily through a variety of jazz, funk, rock and country styles. He has over 20 years of experience performing with touring bands in the Seattle, Providence and Boston metropolitan areas, such as Lost & Found, Stony Lane, Mother and Child Reunion, Masquerade Jones, Johnny B and the Stingers and The Crisis as well as numerous club appearances in New Orleans, San Francisco, Lake Tahoe, Northern Europe and South Africa. A Berklee College of Music-trained musician and technologist, he is also an active teacher and songwriter, and has composed music for several independent films. A veteran bassist from a wide variety of bands and musical styles, Dave Boulos lays down the funky foundation that keeps Mojo Mambo grooving. Known for being quiet, but carrying a big bass, Dave has been seen playing in a wide variety of local area acts from classic rock, new rock, and tribute that include Myriah, Frayed Knot, and Split Infinity. Dave and Steve pride themselves on providing a rhythm section that has a magic ability to pull people from their seats onto the dance floor. A known fixture for over 20 years in the North Shore music scene, Sam’s guitar style brings a rock edge with a blues sensibility to holding down the lead and rhythm guitar chores in Mojo Whether its the funky licks of the 70’s sound to the screaming solos of arena rock, Sam covers all the bases. Sam has performed with some of the most recognized groups in the Boston funk scene to include Mo Bounce, Rough Mix, The Perfect Blend, Guzzle, Flavor, Fried Miracle, Bunktown, and the Full Monty. 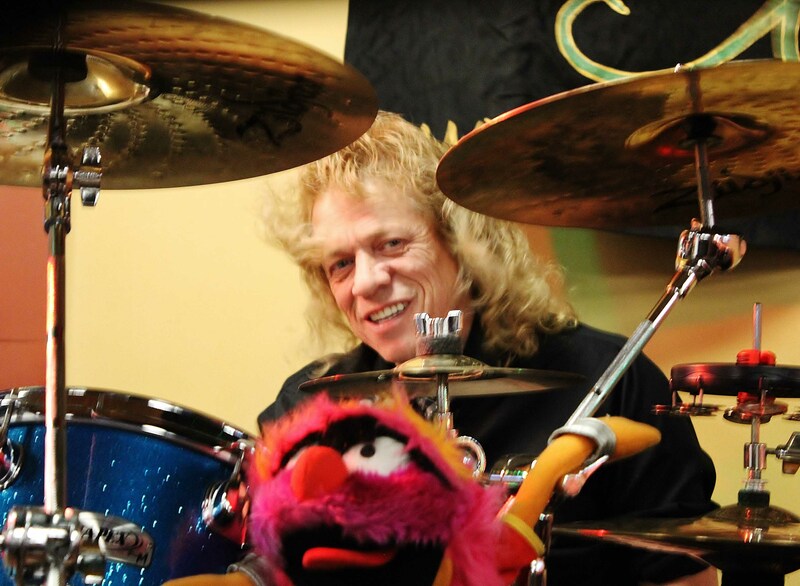 Look up a definition of “live performance drummer” and you’ll find a picture of Steve Arnold next to it. A dynamo on a drum throne, Steve brings a towering talent to the stage earned from many years of performing with area bands, including Starborne, Against All Odds, The Crisis, Rock Candy and The Funk Devils, playing to packed houses at prestigious locations such as the Hatch Shell (on the Boston Esplanade), the Channel, the Paradise and the Hard Rock Cafe in Boston. The pulse of Mojo Mambo, he is the man to watch. Mojo Mambo next show is May 11 2019 at the P6T5, New Bedford. Hope to see you at our shows.